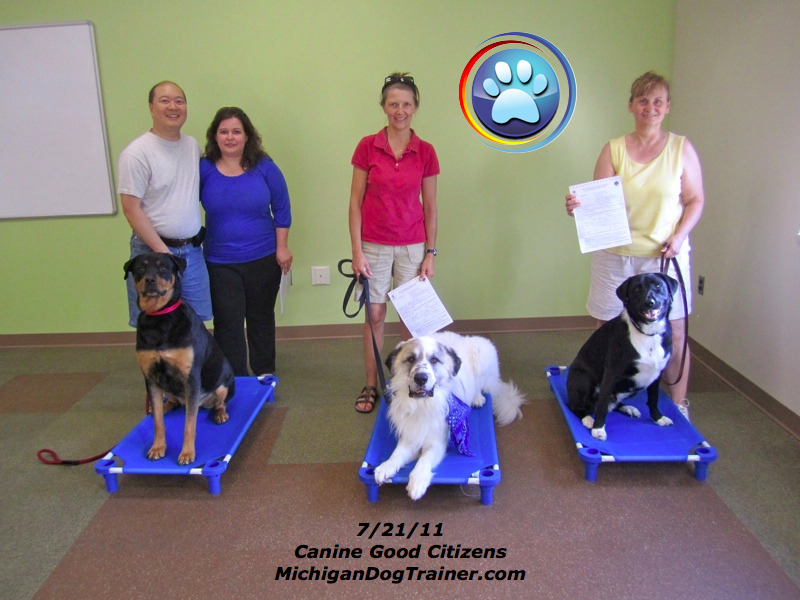 On July 21, 2011 three gentle giants became Canine Good Citizens (CGC) by passing the CGC evaluation sponsored by the American Kennel Club (AKC). They all successfully passed the ten step evaluation after having participated in Michael Burkey’s Advanced Manners group dog class at the Humane Society of Huron Valley (HSHV), Ann Arbor, Michigan. Pictured from left to right are: Erik Cheng and his wife of Ann Arbor, Michigan with their Rottweiler, Tai Ping; Marjorie Laab of Farmington Hills, Michigan with her Great Pyrenees, Rocky; and Ginnie Haid of Ypsilanti, Michigan with Toby, a Rottweiler and Border Collie mix. Congratulations to all! This entry was posted in CGC Stars and tagged American Kennel Club, Ann Arbor, Border Collie, Canine Good Citizen, CGC, dog, dog training, Farmington Hills, Great Pyrenees, group dog class, HSHV, Humane Society of Huron Valley, michael burkey, Rottweiler, Ypsilanti. Bookmark the permalink.